These empty-nester clients had lived in the house for 20 years. She loves to cook and to can vegetables from her beautiful backyard garden. She wanted more space for storing canning goods and a center island. Yet her existing kitchen was too shallow to include an island. MOSAIC Group’s goal was to add just the right amount of space for an island without creating too large of a room. The clients also wanted insulated floors and views of their gardens and lake behind their home. The new addition is approximately 22 feet wide by 4 1/2 feet deep. We needed to add a 22+ foot laminate beam to help support the second story. Our design solution made the heavy beam disappear into the ceiling. Since no houses are ever square, we resolved that issue by leveling out some ceilings and floors for the client. The original floors weren’t insulated when the house was constructed, so we insulated them during the project. With new corner casement windows, MOSAIC Group was able to balance the new facade and open views to the lake and their existing gardens. The new kitchen has custom cabinets, oak floors, beautiful granite countertops, under-cabinet lighting and plug molds, LED lighting, and a unique custom tile. The clients enjoyed picking out the pendants, which really help tie the whole kitchen together. 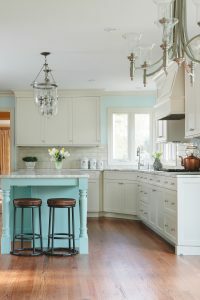 The client suggested making the island a custom sky-blue color she fell in love with in high school many years ago. We mixed a very light tint of that color with white paint when we painted the ceiling. There is a lake on the property that is shared by the neighborhood. Yet you really couldn’t see the lake when you were in the kitchen or on the deck. We replaced their existing deck with a 200-300 square-foot deck made of pressure treated wood with aluminum pickets. We installed corner windows on both ends of the kitchen and also added corner full-height windows so she can see her garden. The new kitchen has greater circulation and flow. The clients are ecstatic about the kitchen and say their old kitchen is now just a distant memory.